Fish products and crude oil exportation are multibillion dollar industries in the United States. Within the month of August of this year, the United States generated approximately 657 thousand barrels of crude oil on a given day (US Energy Information Administration, 2016, figure 2). While drilling is highly important in creating exportation revenue and domestic supply, it also harms marine ecosystems through means of biodegradation, the breakdown of material in the environment. The fate of marine wildlife, the animals and plants that rely on the sea for their survival, is at the hands of oil-drilling companies. ested in exploratory drilling in the Alaskan arctic to locate its untapped resources. 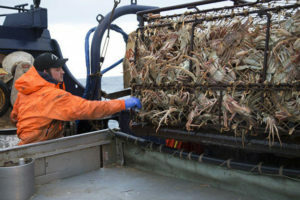 This process can be devastating to the fishermen on The Deadliest Catch and their king crab harvests. In addition to the king crab, salmon, mackerel, and smelts are just three of the many fishes that are commonly consumed by humans (Alaska Department of Fish and Game, 2016). “From 1996 – 2006 sport fishermen in Alaska caught an average of 731,000 pink salmon each year, harvesting an annual average of 154,600 of these fish” (Alaska department of Fish and game, Pink Salmon, 2016, paragraph 1). Similarly to the salmon, the Atka Mackerel “harvested in federal fisheries has averaged almost 119 million pounds (54,000 mt) worth an average of almost $12 million (5-yr avg harvests, 2000-2004, historical harvests, 1977-2004)” (Alaska Department of Fish and Game, Atka Mackerel, 2016, paragraph 1). Drilling in the Alaskan arctic lowers the survival rates of important species, which then affects the market prices. However, there is also great potential for oil development in the arctic. “The Obama administration’s proposed plan will expand offshore oil drilling in the Gulf of Mexico and offer additional lease sales in sensitive waters off Alaska. The new five-year plan schedules thirteen lease sales in six planning areas between 2017 and 2022: Ten sales in the Gulf of Mexico, and three off the coast of Alaska” (Center for Biological Diversity, n.d., paragraph 3). Stanford University posted an article on the Future of the Arctic Oil Reserves and states, “The Arctic is estimated to contain about 90 billion barrels of undiscovered oil, 17 trillion cubic feet of undiscovered gas and 44 billion barrels of natural gas liquids, making up, respectively, 16%, 30% and 26% of the world’s individual undiscovered hydrocarbon resources. Roughly 84% of the undiscovered Arctic resources are expected to be found offshore” (Urban, 2015, paragraph 7). Considering the amount of oil already generated by the United States and the risks of exploratory drilling, we need to ask ourselves, is it worth the risk? While there are great opportunities for growth of the oil industry, the event of an oil spill could be detrimental to the Arctic region. An environmentalist organization states that “all new leasing should be halted in the Arctic where an oil spill in remote areas would be impossible to clean up, and the Gulf of Mexico, which has been treated as a sacrifice zone for far too long. The plan encourages further reliance on oil and threatens species already in danger because of climate change” (Center for Biological Diversity, n.d., paragraph 3). In addition to that, Stanford University states that, “With the shrinking ice cover, the weather patterns are expected to change as well and instability is introduced into what used to be a relatively predictable system. Harsh weather conditions mean more costs. Additionally, with the reduced ice cover, the force of waves on the ocean is expected to rise, increasing the danger of the transport” (Urban, 2015, paragraph 10). In addition to the breakdown of the environment and marine ecosystems, the potential decrease of jobs of fishermen could be detrimental to many families who are reliant upon the fish populations. Based on the literature and our research, there are more negative impacts than positive, making arctic and offshore drilling a poor decision. A common misconception is that oil pollution only results from toxic spills or leaks at drilling sites. However, discharge of oil into the environment occurs during other stages amid the process of extracting oil. When oil vessels are moving to and from drilling sites, they must constantly flush their oily bilge water, where it settles at the lowest part of the ship and sloshes around, mixing with various oils and chemicals. The vessel discharges this mixture, a shiny, glossy substance known as an oil sheen, into the ocean, where it floats endlessly (Wiese & Ryan, 2003). Although small and seemingly insignificant compared to the impacts of an oil spill, oil sheens have devastating effects on marine ecosystems, both long and short term. 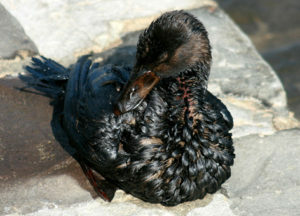 A Surf Scoter covered in oil after the Cosco Busan oil spill in 2007 (Creative Commons). In addition to fish and marine mammals that are impacted by oil pollution, pelagic seabirds are directly also affected. These open ocean birds spend the majority of their life feeding at sea and can be affected from oil pollution by two ways. The first is by ingesting fish or other organisms that are contaminated from oil toxins already. Secondly, seabirds that float on the ocean surface can come directly in contact with oil sheens. When this occurs, even the smallest amounts of oil can damage the structure of the bird’s plumage by absorbing the oil into their feathers. Oil sheens can significantly reduce the birds’ insulation, waterproofing, and buoyancy if the bird comes in contact with these toxins (Wiese & Ryan, 2003). When seabirds are exposed to oil, the microscopic barbules that sit on their feathers generally become clumped together that can restrict their movement and body regulation and ultimately lead to hypothermia and death (O’Hara & Morandin, 2010). Oil sheens can seem insignificant compared to large oil spills or explosions, or go unnoticed to the public eye. But the sheens’ effects have damaging impacts on marine life and seabirds. There are several different species that can be affected by oil sheens. “Marine mammals such as seals, whales or porpoises must surface to breathe” (NOAA, 2016, paragraph 6). By surfacing in oil sheens, these mammals can be directly impacted through skin or eye irritation and can even inhale or ingest the oil toxins. Sea otters and other fur-bearing marine mammals are most affected when making direct contact with these oil sheens. If their fur coats get oily and matted, then the coat’s purpose of keeping the animal warm and regulating their body temperature becomes useless and can result in hypothermia and death (NOAA, 2016). A recurring example of this devastation ensued shortly after the Deepwater Horizon oil spill, when several pictures circulated of marine mammals covered in oil, showing their dreadful fate. While most people are aware of the consequences that offshore oil drilling has on marine wildlife and the environment, many still perceive them as unimportant when compared to the amount of oil the Arctic region could generate. However, think about our fisheries. What could happen if their fish supplies are harmed by chemicals caused by oil spills that are a result of drilling? One of the most common chemicals found in oil is polycyclic aromatic hydrocarbon (PAH), which causes deformities and physiological defects in fishes’ hearts. A study done in the Gulf of Mexico, after the Deepwater Horizon Oil Spill, examined the effects of PAH on the fish species, gulf menhaden. Millemann, Portier, Olson, Bentivegna, and Cooper (2015) state that exposure to this crude oil led to “lesions, pericardial edema, looping defects, and elongated or rounded ventricles” (Millemann et al., 2015, p. 1842) in embryonic fish. Based on the results, the researchers concluded that PAH causes a decrease in heart efficiency, which causes a decrease in their fitness as well. Fishes were put at risk of predation since their swimming abilities were incapacitated (Millemann et al., 2015, p. 1841-1842). Toxic chemicals are not only found in the oil from oil spills, but also in the environmental contaminants that are found from the drilling process itself. These contaminants are found within the drilling mud, cuttings (mixtures of water, clay, minerals, and chemicals used to clean drilling equipment), and liquid waste (Love, Saiki, May, & Yee, p. 717). Love et al. (2013) found extremely large concentrations of trace elements in fish samples from the Southern California Bight. These trace elements include arsenic, cadmium, chromium, lead, mercury, and selenium. Every element they found in the samples surpassed the toxicity thresholds and has a high possibility to cause harmful effects (Love et al., 2013, p. 729). Mercury, a lethal neurotoxin, is one of the first trace elements that people relate to toxicity in fish. One of the effects of this toxin is impaired reproduction, and these poisoned fish and wildlife are capable of passing on toxic doses from the mother to the embryo while the egg is formed (Love et al, 2013, p. 730). For aquatic wildlife, large exposure to either lead, selenium, cadmium, or chromium, can also cause impaired reproduction along with reduced survival and growth rates and abnormal muscle and lung contractions (Love et al., 2013, p. 729-730). Additionally, for birds and mammals that feed on lead-contaminated prey, they can suffer from impaired, or abnormal, learning and social behaviors (Love et al., 2013, p. 730). People do not realize that oil does not merely disperse into the water once an oil spill occurs. It has lingering effects and it spreads into the bodies of everything that it touches – from algae and plankton to fish, crustaceans, and seabirds. With oil spreading in one part of the ocean, how long will it take for pollution to occur in all parts, leading to a mass extinction of all species whose life is centered around the ocean? Oil remediation takes several years to completely rid of the oil/petroleum in the bodies of waters. During this time, the toxic effects amplify when consumed throughout the food chain. This amplification effect is known as biomagnification, which is an increase in pollutant concentration from one tier in a food chain to another (Mader, 1996). Seafood is a major food source, extending beyond the ocean for human consumption. In 1976, a study performed on Long Island Sound that looked at different levels of dichloro, diphenyl trichloroethane (DDT) in the tissues of various animals. Bioaccumulation, an increase in pollutant concentration from the environment to an organism in the first tier of a food chain, for these animals overall magnified over 200,000 times the original amount of toxin (Mader, 1996)! From the chemical in the water to zooplankton, DDT bioaccumulates 800 times the original amount in the zooplankton body. From zooplankton to fish #1, it was 31 times of 800. From fish #1 to fish #2, it was 1.7 times the previous amount and from fish #2 to a seagull, it was 4.8 times that previous amount. Overall, biomagnification of 202, 368 times the original amount of DDT that was found in the water (Mader, 1996)! This study is applicable to other toxins that have potential to biomagnify, such as PAH and heavy metals (eg. mercury, cadmium, lead, nickel). As stated previously, PAH is one the most common toxins that is found in oil/petroleum and has been found to be carcinogenic. The presence of PAH found in seafood is harmful when consumed in decent amounts overtime. However, since PAH is commonly found in oil, how much do you think is biomagnified in the seafood that we eat, particularly fish? What about the heavy metals that are used to clean drilling equipment that also have the potential to biomagnify, such as mercury, lead, cadmium, chromium, and selenium? All of these toxins have harmful effects on not only fish and other seafood, but also the mammals – including humans – that consume them. These effects range from affecting the nervous and reproductive systems to potentially causing cancer. But what if seafood do not even make it to the market, how much profit is lost by commercial fisheries if all their time and efforts to catch all the fish no longer mattered if they were not able to make it to market? Oil spills are not only affecting the large bodies of waters and the marine wildlife that inhabit these bodies of waters, but also the income of commercial fisheries and the health of our ocean and in extension, the health of humans. The ocean is home to millions of species and hundreds of unique ecosystems. It covers about 75% of the Earth, supplying people with half of the Earth’s oxygen. However, if the ocean is polluted, then would the health of humans’ decrease as well? Oil spills are a major problem in marine environments and the best way to combat it is to prevent whatever is causing the problem from happening. After the Deepwater Horizon oil spill in the Gulf of Mexico in 2010, the President signed the Restore Act which directed 80% of the civil fines into a trust fund for programs, projects and activities to restore the environment in the Gulf of Mexico (U.S. Dept. of the Treasury, 2016). To prevent similar disasters that need legislation to help restore degraded ecosystems, a moratorium must be placed on exploratory offshore drilling in the Alaskan arctic region. By establishing an oil ban, pristine marine ecosystems will remain healthy and unpolluted, which will preserve the habitat integrity of marine fisheries. We cannot risk having natural disasters to unnecessary offshore exploratory drilling in such remote and sensitive ecosystems. Such a moratorium on Arctic offshore oil drilling brings concerns to the Americans that rely on oil supply in order to function in their everyday lives. Opening up drilling in this region could supply vast amounts of oil, leading to a drop in consumer prices. However, regulations placed on Arctic drilling by the Department of the Interior (DOI), including standards for improved blowout preventers, capping stacks, contaminant systems, relief wells, and second rigs, made exploring the area for resources more costly for oil companies (Hoag, 2016). In September of 2015, Dutch Royal Shell gave up its exploratory efforts after spending more than seven billion dollars in the region (Hoag, 2016, paragraph 1). For the remaining oil companies looking to explore the region, the DOI estimates that adhering to the new drilling standards will cost approximately two billion dollars over the next ten years (Hoag, 2016, paragraph 12). Oil companies have not discovered a stable source of oil in the area; therefore, halting the search would bring no additional cost to consumers while reducing the amount of money oil companies spend on futile exploratory efforts. For those who believe that continuing the search is well worth the money spent and the risk involved, consider the impact of the Deepwater Horizon oil spill, the world’s largest oil spill. The spill cost British Petroleum (BP) a whopping $61.6 billion, resulting from lawsuits, Clean Water Act penalties, and general compensation for natural resource damages (Mufson, 2016, paragraph 2). Fadel Gheit, oil analyst at Oppenheimer & Co. stated, “Before the accident, BP had a market capitalization of $180 billion. The accident actually shaved off one-third of the market capitalization of the company. It’s a miracle that the company is still in business” (Mufson, 2016, paragraph 5). However, BP is by far the largest oil drilling company. A a result of the oil spill, BP spent money that is beyond the market capitalization of the next two largest U.S. integrated oil drilling companies, ConocoPhillips and Occidental Petroleum (Mufson, 2016). Offshore oil drilling in the Arctic comes with more risk due to inclement weather, ice conditions, and isolation, leading to an increased chance of detrimental oil spills occurring in the area, at the cost of oil companies and members of the marine ecosystem (Hoag, 2016). Offshore oil drilling causes negative effects throughout all levels of the marine ecosystem around the United States. The Alaskan arctic is not only a sensitive ecosystem, but it is also extremely remote. If a tragic spill or explosion were to occur in this unique ecosystem, it would make recovery and restoration efforts much more difficult, and cause devastating impacts commercial fisheries, a vital resource for local economies. A moratorium must be placed in the Alaskan arctic to prevent future disasters similar to the Deepwater Horizon oil spill that occurred in the Gulf of Mexico. Alternative locations and energy resources need to be considered elsewhere to keep this pristine ecosystem untouched from future oil drilling. Mader, S. S. (1996). Biology (5th ed.). Dubuque, Iowa: William C. Brown. Certainly an incredible submit. Hats off for you! The knowledge that you have supplied is incredibly handy.